STORY UPDATED at 4:15 p.m. Thursday. A display from The Clothesline Project. Image from The Clothesline Project website. ON SUNDAY, JULY 26, a clothesline takes on an entirely different purpose than drying laundry as the Crisis Resource Center of Steele County and Redeemer Lutheran Church of Owatonna bring The Clothesline Project to Central Park in Owatonna. Begun in Cape Cod in 1990, the national art project raises awareness about violence against women. Those impacted by such violence express their emotions by writing on t-shirts. The shirts are then strung on a clothesline. 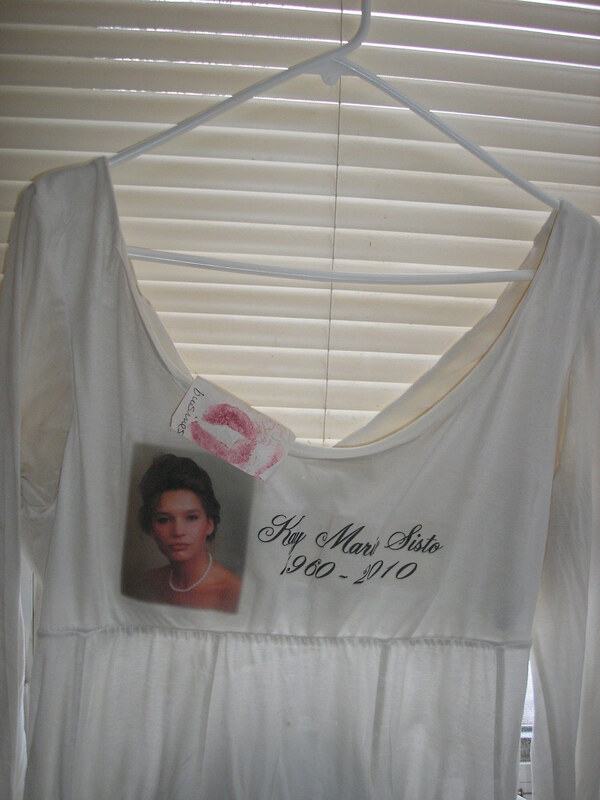 This shirt was added to The Clothesline Project four years ago by Kim Sisto-Robinson of Duluth. It honors her sister Kay, who was murdered by her husband in 2010. The Minnesota Coalition for Battered Women manages The Clothesline Project traveling exhibit in Minnesota. Eighty decorated shirts representing the 80 individuals killed through domestic violence in Minnesota during the past three years are part of the display coming to Owatonna. From 3 p.m. – 7 p.m. Sunday, attendees can create and view t-shirts honoring victims and survivors of domestic violence. A ceremony begins at 4 p.m. with remarks by the Rev. Kirk Griebel, pastor of Redeemer Lutheran; reading of a mayoral proclamation declaring July 26 as Domestic Violence and Abuse Awareness Day in Owatonna; and remarks from Crisis Resource Center and law enforcement representatives. The back of the shirt includes the names of Kay’s three children. Kim found the lips blotted on a piece of paper in one of Kay’s books. A Duluth printer printed them on the shirt. Kay kissed everything with her big pink lips, says her sister. The Clothesline Project promises to be a powerful visual focused on raising awareness about domestic abuse and violence. I encourage you to attend. I expect every single one of you knows a woman and/or family that has been impacted by this. I do. Many. According to the National Coalition Against Domestic Violence, one in every three women will suffer some form of physical violence by an intimate partner within their lifetime. For men, that number is one in four. Remember also that domestic abuse is not always physical. It can also be emotional, mental, spiritual and social. Do all you can as an individual to stand strong against domestic abuse and violence. Refuse to remain silent. Come on Sunday. 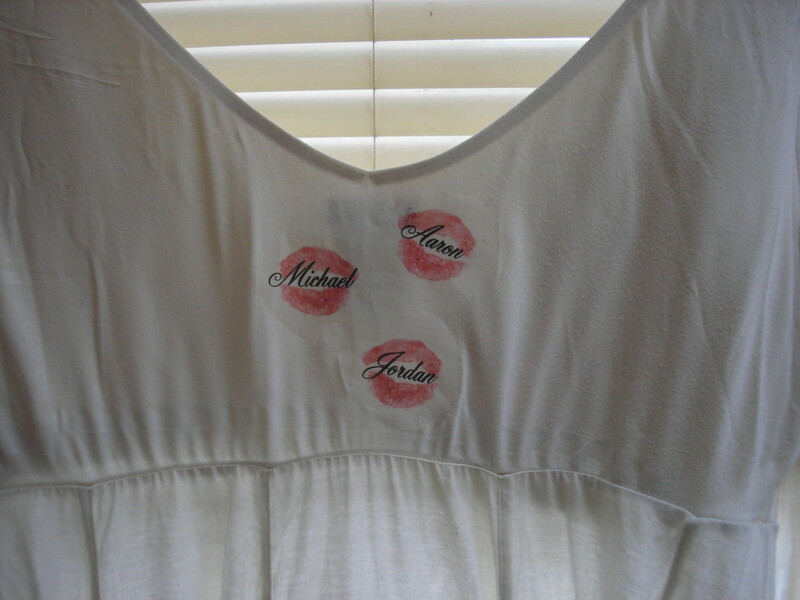 Create a t-shirt. Join those who are choosing to break the silence. 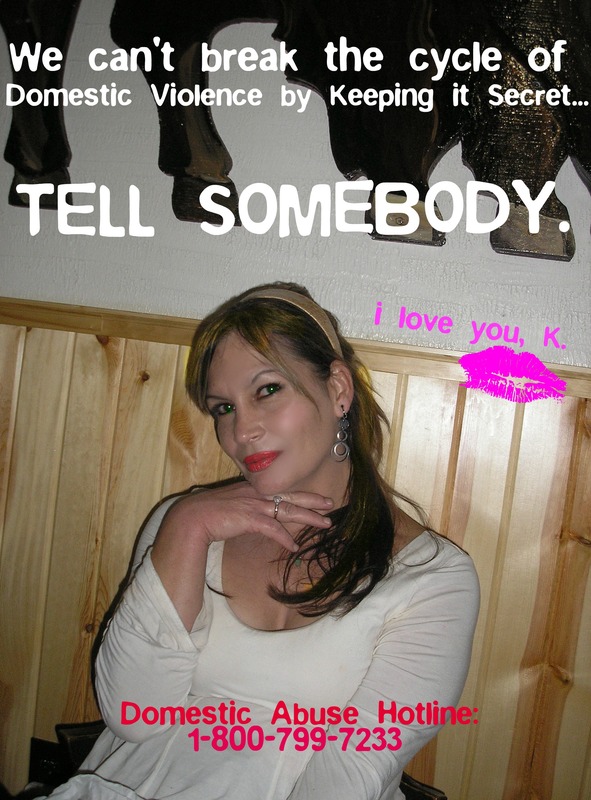 FYI: If you are currently in an abusive relationship, seek help. Call a local safe haven/resource center or the National Domestic Violence hotline at 1-800-799-7233. If you are in immediate danger, call 911. Leaving an abuser is an especially dangerous time. Seek help and have a safe plan to leave. You will need a protection plan for a year or longer after leaving your abuser. There are people willing to help. You are worth it. You deserve to live free of abuse of any form. Kim Sisto-Robinson has made it her mission to speak out against domestic violence. She is the voice of her sister Kay, pictured here. The shirt Kay is wearing is now part of The Clothesline Project. Thank you to Kim Sisto-Robinson for sharing the photos of her sister and of The Clothesline Project shirt honoring Kay. 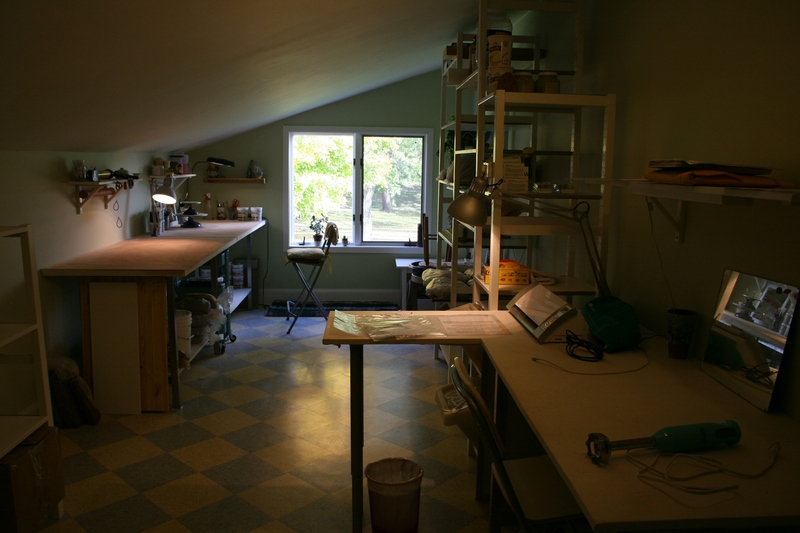 Ceramic artist Kip O’Krongly’s second floor studio. 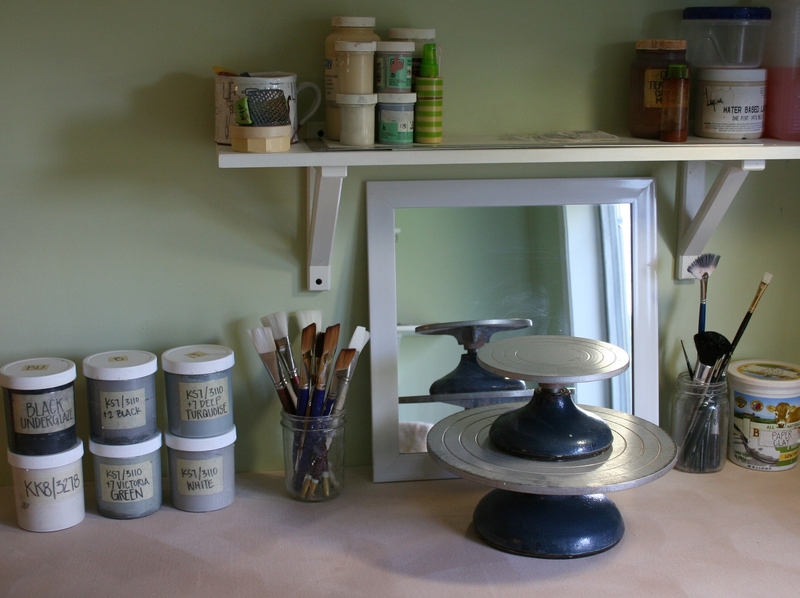 HER ART STUDIO POSSESSES an almost industrial, spartan look. Clean lines. Tidy. Labels. Schedules. Everything just so. Supplies and tools, all in their place. Kip O’Krongly freely admits to her need for orderliness in the second floor ceramics studio of her Northfield home. Gertie rises from her spot beneath the windows. 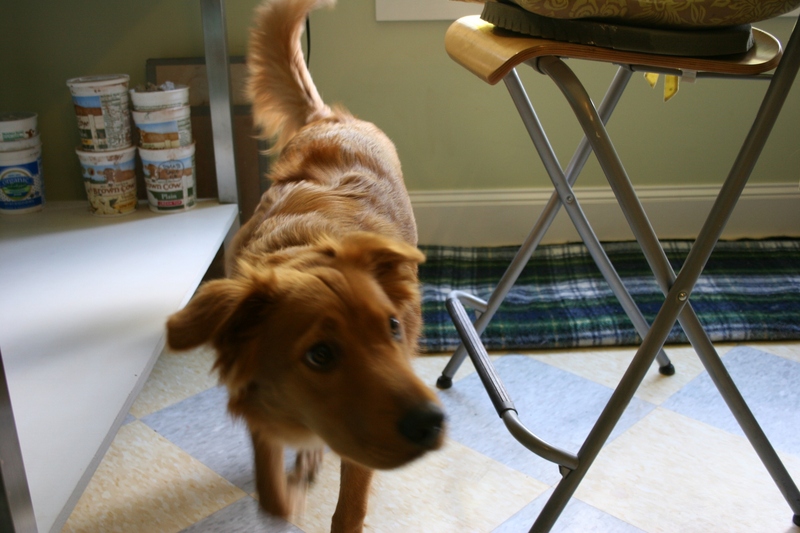 Here, in this slanted ceiling room with the tile floor she laid and with sunlight streaming in, Kip’s dog, Gertie, rests briefly on a blue and green plaid blanket below double windows. A short respite from visitors, like me, who have filtered into Kip’s studio and home during the South Central Minnesota Studio ARTour. During this (last) weekend open house, I am visiting the studios of select artists I have not seen on past tours. 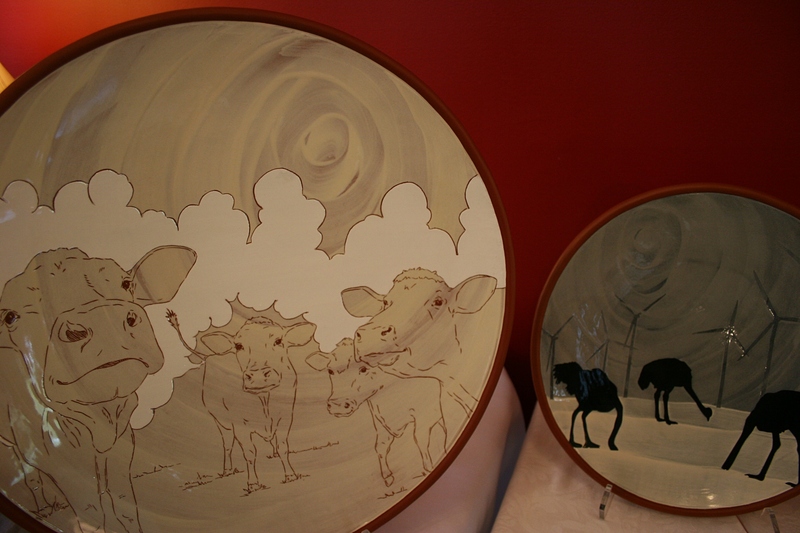 Art Kip creates on her ceramic plates sometimes makes statements about social issues, like the piece on the right. 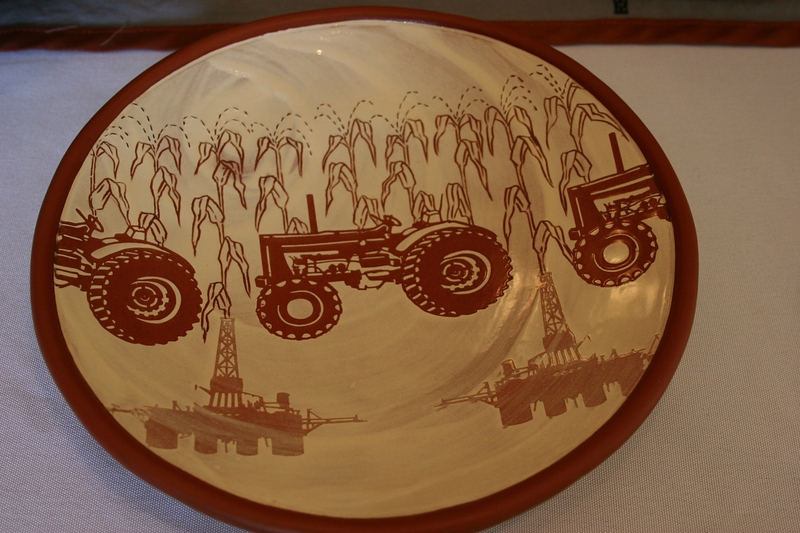 I am drawn to Kip’s place by the tractors, wind turbines and corn I’ve seen showcased online on her ceramics. Definitely a transportation themed piece going here. She tells me that themes of food, transportation and energy run through her work. Once she points that out, I ask whether she was raised on a farm. No. Alaska. We don’t get into details about the themes, but I mention that I grew up on the southwestern Minnesota prairie and am visually troubled by the wind turbines that populate the landscape, ruining, in my opinion, the aesthetics of the prairie. More than tractors and corn… Corn grows from oil rigs. Kip says she welcomes how her art opens up dialogue and the opportunity to hear differing opinions on social issues. And I sense her sincerity in stating that. 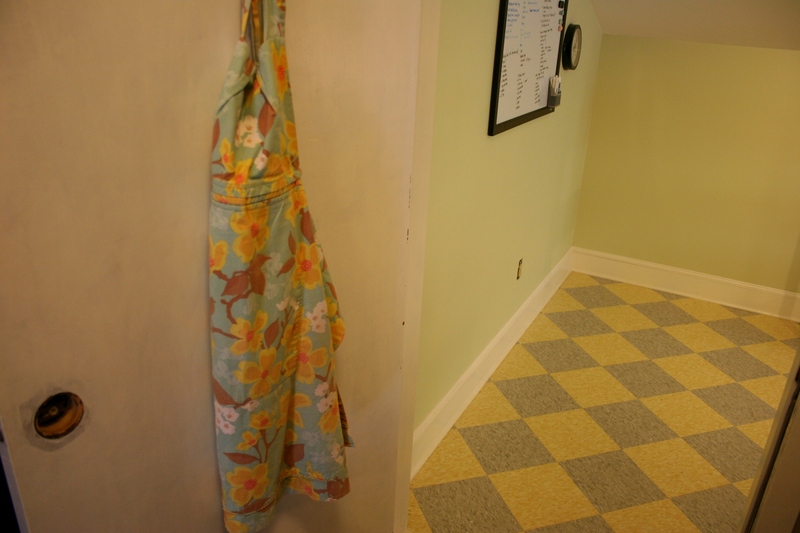 The door opens into Kip’s studio. I am intrigued, too, by her name. Kip O’Krongly. It possess a certain snap, a certain strength, a certain ruggedness. I never ask. But I don’t need to. Her work, talent and confidence as an artist define Kip O’Krongly. 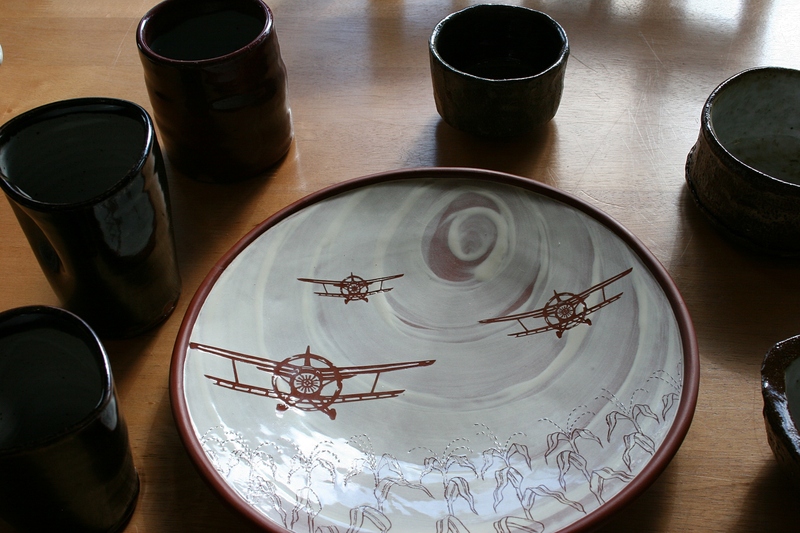 FYI: The works of two other ceramics artists, Joel Froehle and Juliane Shibata, were also showcased in Kip’s home. However, they were not in-house when I visited. Please click here and then here to read previous posts from the South Central Minnesota Studio ARTour. And check back for more posts in this five-part series.